There was some talk out of Boston about the Red Sox exploring a multiyear deal with Jacoby Ellsbury this offseason, though it's perhaps no surprise the club decided to handle its front-office shakeup and more immediate player concerns before trying to lock up a player who is still under team control through 2013. There is likely also a sense of wanting to see exactly they really have in Ellsbury before committing to a major contract. Last season, Ellsbury didn't only bounce back from an injury-riddled 2010, he dramatically raised his own performance ceiling. Ellsbury finished second in AL MVP voting after slugging 32 homers and hitting .321/.376/.552 in a league-best 732 plate appearances, just to erase any doubts about his durability. All three totals in his slash line were career highs but the power was particularly surprising — Ellsbury had hit just 30 homers in his entire major and minor league career (2705 plate appearances) before 2011. To top it off, Elsbury also provided excellent center field defense (a 15.7 UZR/150 and a Gold Glove) and stole 39 bases. The Red Sox avoided arbitration with Ellsbury by agreeing to an $8.05MM deal for 2012, a significant bump up from his $2.4MM 2011 salary. If Ellsbury comes even close to repeating his performance from last season, he'll earn another big raise for his last arbitration year; MLBTR's Ben Nicholson-Smith projected as much as a $13MM salary for Ellsbury in 2013. For our long-term price range, let's look at the contracts received by Matt Kemp and Ellsbury's teammate Carl Crawford over the last two offseasons. Kemp was also heading into his last arbitration year when he signed an eight-year, $160MM extension with the Dodgers in November. Crawford, meanwhile, was 29 (Ellsbury hits that age in September) when he signed his seven-year, $142MM free agent deal with the Red Sox on the open market. Hard as it would've been to believe 12 months ago, power is the key statistic in determining the size of Ellsbury's extension. If he puts up another 30-homer season, agent Scott Boras will argue that Ellsbury is now a proven five-tool threat and deserves a Kemp-like contract. If Ellsbury's homer total drops even to around 20 dingers, the Red Sox will have an argument for a slightly lesser but still-sizeable contract akin to Crawford's deal. Of the five 2012 projections used by Fangraphs, all have Ellsbury's OPS dropping significantly next season, with three of five forecasting a drop of more than 100 OPS points. It's worth noting that Ellsbury's center field defense is also not quite a proven commodity. He posted a -10.0 UZR/150 playing the position in 2009, leading to the Red Sox signing Mike Cameron that offseason to take over in center. Presuming Ellsbury, like most players, doesn't want to talk contract once the season begins, Boston has a month to work out an extension while they still have some leverage over the length of the deal. Right now, the Red Sox could aim for a six-year extension that covers Ellsbury's last arbitration year and his first five free agent seasons. This would cover Ellsbury through his age-34 season, sparing the club at least one year of paying $20MM to a player in his mid-thirties (though the Sox could add a club option). Of course, as noted earlier, if Ellsbury's power surge continues into the start of the 2012 campaign, the leverage swings back in his direction and Boras will look for a minimum of seven years in any new contract. Boras usually advises his clients to test the free agent market, so it wouldn't be a surprise to see the 2012-13 offseason also pass without a multiyear deal between Ellsbury and the Red Sox. Two high-profile Boras clients have recently signed extensions prior to free agency — Carlos Gonzalez's seven-year, $80MM deal with the Rockies and Jered Weaver's five-year, $85MM deal with the Angels — but neither of those contracts matches Ellsbury's situation. Gonzalez was still four years away from free agency and Weaver specifically wanted to stay in Anaheim, even at the cost of leaving millions on the table in free agency. Though Boston has been conscious of exceeding the luxury tax limit on payroll this winter, the team obviously has the money to pay Ellsbury fair value if they want to make him part of their long-term future. A lot depends on what Ellsbury does at the plate in 2012, but a seven-year, $133MM deal ($13MM in 2013 to match his arbitration number and then an average of $20MM in each of the following six years) is definitely within reach. Ellsbury would join Crawford and Adrian Gonzalez as Red Sox players locked up through at least 2017. With Jon Lester, Dustin Pedroia and Clay Buchholz all on reasonable contracts that include equally reasonable team options, Boston's long-term payroll is relatively flexible for such a big-market franchise. Jacoby Ellsbury is a boss! Ugh Scott Boras….this man could sell a snowball to the devil. I feel like hes hitting the market. Saux will be a little gun shy about dishing out money like that for a speed guy again. Ultimately I think they’ll work something out. One great year from Ellsbury, and I’ll bet that was a “I’ll show you” year, so I wouldn’t get all jiggy about a new contract at big bucks—-just yet. I would. Certainly his power numbers will be way down this year, but he’ll still have a high average and steal a ton of bases. As long as he stays healthy, he’ll be a guy who’s worth every penny. I think that Ellsbury and Boras will use the sox as leverage. Ellsbury will probably act like he’s serious about staying and sign elsewhere. No clue where he would want to go but from everything I’ve read he has never been happy with Boston. One can only speculate that the current circus will only get worse with Valentine as manager. In the end, he may be fed up so much that he will give a discount to any team who is at least reasonably close to the sox offer. He will go where the most money is like most free agents. Small sample size. He missed much of two years with injuries. Like they did with Pedroia, and Youkilis, and Lester, and Buchholz, and Papelbon right? Exactly.. The extensions they have signed with their own drafted players have all been to the teams favor. If he puts up another 30-homer season, agent Scott Boras will argue that Ellsbury is now a proven five-tool threat. Unless the Red Sox come through big time, Boras will have this guy in free agency. Logically, he has four tools at most, but you have to account for who his agent is. Scott Boras will put together a manifesto explaining that, when a player’s other four tools are as solid as Jacoby Ellsbury’s, the mere fact that he HAS a left arm justifies paying him as a five-tool guy. Heck, he’ll probably even include a few Glamour Shots and pitch Ellsbury as a six-tool player. I don’t get it. ONE amazing season and he’s suddenly worth $20MM a year over 2/3’s of a decade? I’ll admit, he has a solid average, great base running numbers- but when do those drop out?- and last year’s power was undeniable…But maybe lets see if he can repeat it? Sox are in a weird position- he’s gonna get paid. But does he get paid that hometown discount price of around $8MM a season like so many before him, such as Youk, Pedroia, etc. or does he try to duplicate last year and land big money? I mean, folks; Youkilis put up nearly identical numbers once upon a time and barely got more than $10MM per season for his efforts, though that was partly as a hometown discount out of respect for the Sox. Anyway, I really don’t think this kid is automatically worth a $100MM contract. Lets wait and see. “I don’t understand Ellsbury. The kid was as pure as snow and has sold his soul” Or something to that regard. Can’t see Ellsbury taking much (if any) of a hometown discount after he dumped his original agent when he only played in the majors for a couple months, did very well and dumped his original agent for Boras.. The man has $$$ on his mind and had since the start as Schill said over that winter. With all due respect to Mr. Polishuk, the Ellsbury situation is currently a hybrid of where Gonzalez was when he extended and where Kemp was when he extended. Gonzalez had some years left before F/A. Ells has 2. Gonzalez had a single year of MVP-like performance. Ells does too. Kemp is a proven player over the long-haul. Ells is not. Ells has a strong probability of regressing off of his MVP-like year. Gonzalez did so. Kemp has remained a fairly consistent high-level performer. I would say, right now, the balance is 60% Gonzalez, 40% Kemp. A well constructed extension offer for Ells would be $13MM for Arb Yr. 3 (2013), $15MM for F/A Yrs. 1 & 2 (2014 & 2015) and $20MM for F/A Yrs. 3, 4 & 5 (2016, 2017 & 2018), with a team option for 2019 at $22MM. That’s 6 years at $103MM, possibly 7 at $125MM. If a bum like Zimmerman gets a $100 million then Ellsbury will get 9 figures too. He is not taking any discount nor should he. The economics of today is crazy in how much guaranteed money these guys get. The only fly in this ointment is Boras. Were it not for him I would be very confident that the Red Sox would make an offer to Ellsbury that would make everyone happy, including Red Sox Nation. Boras is such a greedy dirt bag that he pushes all his clients to become free agents. My sincere hopes are that Ellsbury has another fantastic season and signs a huge contract extension with the Red Sox after we win this year’s World Series. yay or nay 40/40 for Ellsbury in 2012? 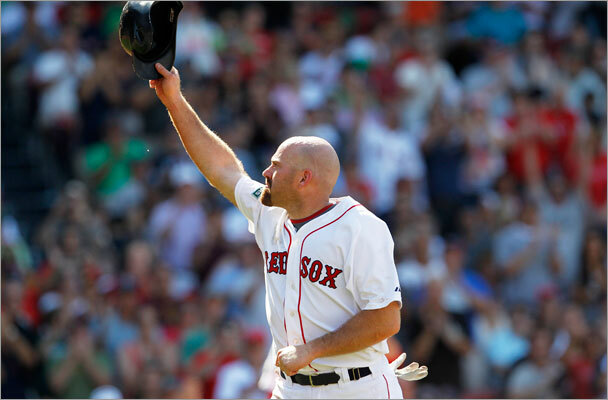 After the way he was treated by the Red Sox in 2010, why would he want to commit to staying in Boston. Boras of course will not be recommending any extensions. Assuming he does not believe 2011 was a fluke and he feels healthy, he will do far better if he becomes a FA after 2 years than signing an extensions. Ellsbury should not consider any offer less than Crawfords 7 yr 142 million deal. The Red Sox may not be able to afford him. They are up against the luxury tax, have to build a new 400 million dollar stadium for Liverpool, and now these child abuse victims are going to want a big pay off.